Jakarta BISA was established in responds to the need of deeper information for strategic decision making. Decision maker needs rooted information which describe actual condition, rather than cosmetic report made by others for their selfish purpose. Thus, the decision making will be taken after comprehensive actual facts data examined. Since October 2009, our team has been trusted as local partner to do due diligence of corporation from many companies (inducing their share holders) spread out within different industries , by one of the respected worldwide risk management firm. We have met the top management of South East Asia & Greater China regional office in Singapore for a very confidential and risky investigation finding report, since our finding may affecting millions of dollars risk of one giant MNC. And such quality of our report, keeps us stay close with current and future jobs from them. Jakarta BISA also understand, that basically business owners does not want to go to court for any business dispute. Therefore they need someone who can speak and mediate both sides fairly. 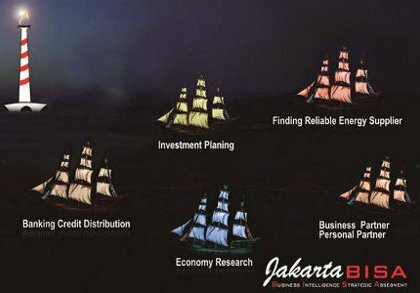 Supported by well experienced consultants who are currently teaching at leading business school (a combination of smart theory and excellence experience), Jakarta BISA provides services to meet the need of business owners, top management, and even individual, for strategic decision making. And not only consultants, but we have excellence ground agents to seek those hidden information for you. The actual condition one, not the cosmetic one!